US President Barack Obama and Russia's President Vladimir Putin walk from each other after speaking and shaking hands before an economic leaders meeting at the Asia-Pacific Economic Cooperation Summit at the Lima Convention Centre. The main intrigue of the APEC (Asia-Pacific Economic Cooperation) summit that has just finished in Peru, at least as far Russian observers were concerned, was the question of whether Russian President Vladimir Putin would have a bilateral meeting with the outgoing U.S. president, Barack Obama. The talks, which did take place, are likely to have been the two leaders’ last ever as presidents. Russian President Vladimir Putin has held brief talks with his U.S. counterpart Barack Obama on the sidelines of the APEC summit in Lima, in what is likely to be the last meeting between the two as leaders before U.S. President-elect Donald Trump takes office in Washington. Given the Obama administration’s tough steps and rhetoric in relation to Moscow, Trump’s election added a touch of piquancy to the prospect of a meeting between the outgoing Democratic president and the Russian leader at the Nov. 19-20 summit in the Peruvian capital. The president-elect has more than once stated the need to cooperate with Russia, while some even claimed that Moscow had attempted to influence the election in his favor. On the first day of the summit, Kremlin press secretary Dmitry Peskov said there were no plans for formal talks between the U.S. and Russian presidents at the summit, but that an impromptu meeting at one of the group events for APEC leaders at the summit was a possibility. On Nov. 19, no such meeting took place, but on Nov. 20 the two leaders did have a brief chat on the sidelines of one of the sessions of the summit. A video of the conversation, which lasted just several minutes, was posted online. As Putin said at a news conference after the summit, despite the fact that “[over the past years] the dialogue between our countries was difficult; one could even say it was hard to work with each other,” the two presidents assured each other of their unfailing respect. Putin thanked Obama for the “years of joint work,” adding that he would be happy to welcome Obama in Russia if he ever wanted to visit. For his part, summing up their meeting Obama said that he had urged Putin to work on fulfilling Moscow’s obligations in Ukraine under the Minsk accords in order to make progress there before he leaves the White House in January 2017. Obama also told Putin it was necessary to agree a humanitarian ceasefire around the besieged Syrian city of Aleppo with a further transition to a political settlement in the country. 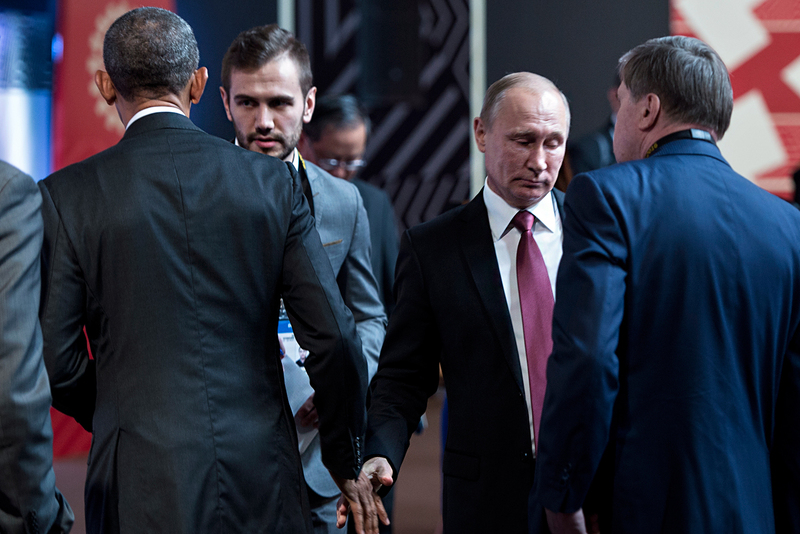 In addition to the meeting with Obama, Putin also held longer, full-fledged talks with several of the regional leaders. His meetings with the leaders of Japan and the Philippines caused particular interest. The talks with the Japanese prime minister were marked by the uncommon warmth displayed by both leaders: Shinzo Abe and Vladimir Putin addressed each other by their first names. Looking ahead to Putin’s upcoming visit to Japan, Abe promised to entertain the much-welcome Russian guest in “a traditional hot-spring hotel.” It is expected that one of the main issues on the agenda of Putin’s visit, which is scheduled for mid-December, will be a discussion of Tokyo’s new proposals on resolving the long-running dispute between the two countries over the Kuril Islands in the Pacific. According to Gleb Ivashentsov, an Asia-Pacific Region expert from the Russian Presidential Academy of National Economy and Public Administration, the talks with Duterte were an important event because the Philippines, “which previously were in the U.S. orbit,” are now declaring their intention to develop links with China and Russia. With its 100-million population, the Philippines is a significant distribution market, Ivashentsov told RBTH. He went on to add that this APEC summit was particularly important for the development of the association, especially in the light of the fact that the future of the U.S.-led Trans-Pacific Partnership (TPP) is up in the air, as Donald Trump has said he does not support the project. This opens up new opportunities for developing an APEC free-trade zone, which Moscow supports since it was never invited to join the TPP. In Lima, Putin made his first public statement on the high-profile arrest of Russian Economic Development Minister Alexei Ulyukayev on charges of bribe-taking, describing it as “a sad fact.” However, Putin insisted that this incident had not only done no harm to the business climate in Russia (as some analysts had warned) but, on the contrary, was conducive to improving it. Putin also said that Ulyukayev’s arrest would in no way affect his attitude to the government and would have no impact on the situation with Russia’s biggest oil company Rosneft, which was involved in the case. Speaking about the oil sector in general, Putin said that Russia would be prepared to freeze oil production if an agreement to that effect was reached with the OPEC countries.